Once you have connected your calendar and customized your meetings tool preferences, you can create meetings links to share with your contacts so they can easily book time with you. The meetings links will sync with your connected Gmail or Office 365 calendar so your appointments will always be up-to-date. In the upper right, click Create meeting link, then select Personal. Continue setting up your meetings link following the steps below. On the Details page, edit the meeting's basic information. Meeting photo: this photo will display at the top of your meetings link page. Hover over the photo and click Change photo to edit it. Meeting headline: this headline will display next to the meeting photo at the top of your meetings link page. Meeting name: the internal name that appears in your meetings dashboard and used when you insert the meetings link into an email. Meeting link: the link that prospects use to book this meeting. The link can be edited by paid Sales Hub or Service Hub users only. This value is not editable after creation. In order to have a link at a new URL, you will need to create a new link. Meeting type (Sales Hub Professional or Enterprise or Service Hub Professional or Enterprise only): choose a meeting type from the dropdown menu. Duration: the length of time visitors can book you for when clicking this meetings link. Click + Add duration to add more options. When you're done editing your meeting details, click Next. Add information about your meeting's location and edit the details that will be included in the calendar invite. Location: include information about how you will connect with your meeting attendee. This can be a call-in link, a physical location, etc. This location will appear in the contact's calendar invite, and the event created on your default personal calendar. Add videoconference link: if you have integrated Zoom with HubSpot, select a videoconference link to add to your meeting invite. If you have not set up the integration, you will not see this option. Invite subject: the calendar invite name, and the name of the event created on your default personal calendar after the meeting is booked (e.g., Product Demo with Lauren). You can insert personalization tokens in the subject by clicking Contact token or Company token. Invite description: a description of the meeting that displays once a meeting is booked. This description will appear in the calendar invite your contact receives, and the event created on your default personal calendar. Language: select a language for your meetings link. Date and number format: select a country for your meetings link's date and number styling. Reminders: reminder emails are sent three days before the meeting and again one hour before the meeting. 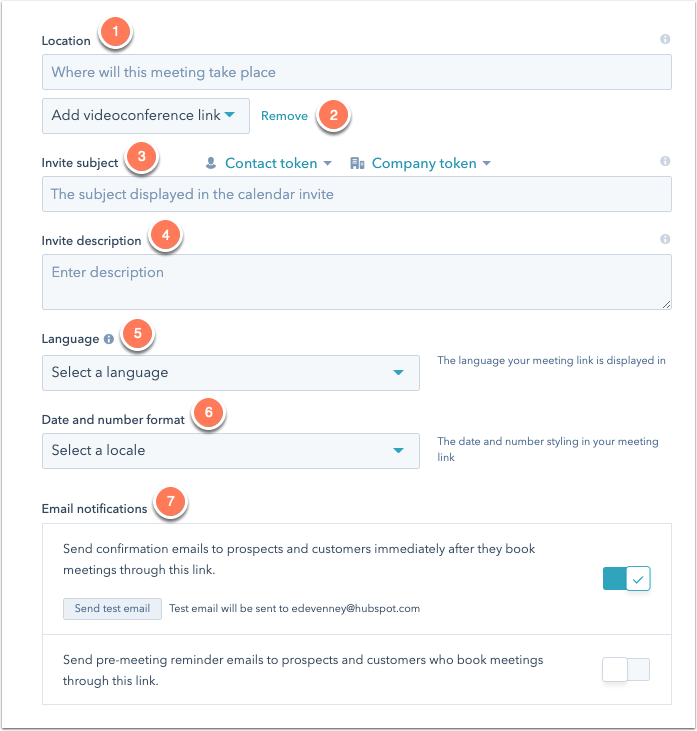 Select the Send reminder emails to prospects who book meetings through this link checkbox to enable reminder emails for the meeting. Select the Include the Invite Description in reminder checkbox to include the invite description you've entered above in the reminder email. Click Add another reminder for additional reminder emails, and click the delete trash can icon to delete a reminder time. You can add up to three reminder times. Click Preview reminder email to preview the reminder email your prospects will receive. The language of the email will match the language you specified in the Language dropdown menu above. 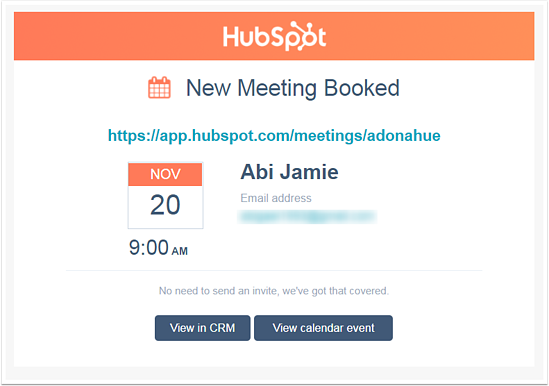 Please note: for Round Robin meetings, the reminder email will be sent from the HubSpot user who has been booked for the meeting with the prospect, not the HubSpot user who created the meeting link. When you're done customizing your meeting's configuration, click Next. Decide on which days and times you will accept meeting bookings. 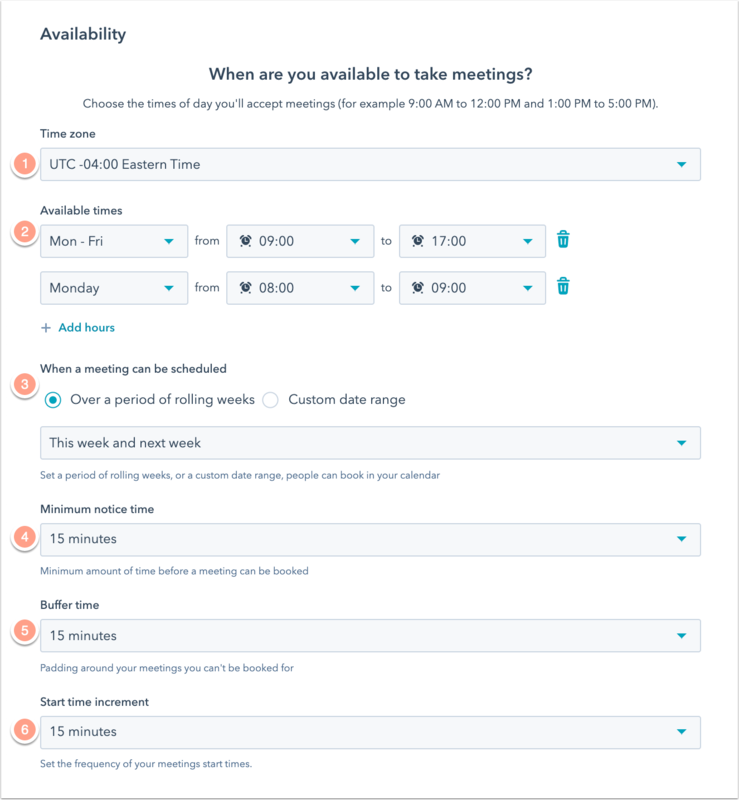 Please note: your meetings link's available times will display in the contact's time zone settings. For example, if the contact's computer is set to Pacific time, the times will display in Pacific time. The contact's calendar settings determine the date and time of the calendar event sent to the contact after booking a meeting. Use the dropdown menus to set your availability. You can set individual times for each day of the week, or apply the same availability to every day, Mondays - Fridays, or weekend days. You can also overlap available time slots. For example, if you're available for meetings Monday - Friday from 9am-5pm, but work later on Monday nights, click + Add hours, then extend your hours for Monday evenings. Minimum notice time: the minimum amount of time before a meeting that someone can book time with you. 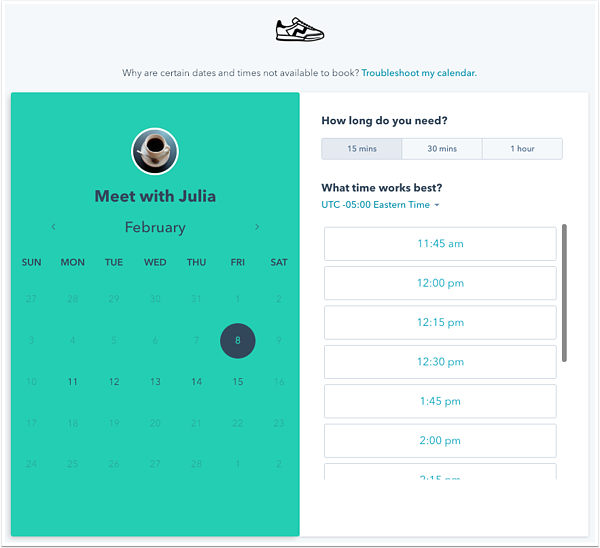 Buffer time: padding of time around each of your meetings. 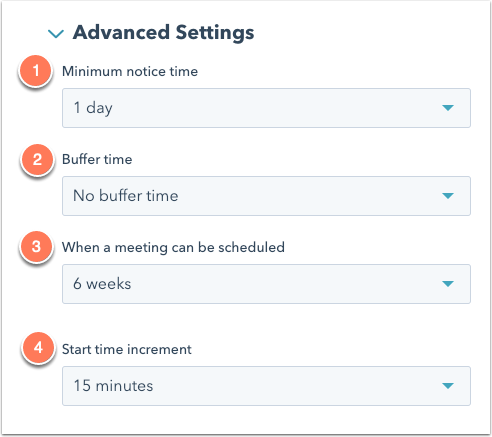 The buffer time allows you to prevent meetings from being booked too closely together (e.g., if you have a meeting from 1:00 - 1:30pm and have a buffer time of 30 minutes, the next available meeting time would be 2:00pm). When a meeting can be scheduled: number of weeks from now that people can book time on your calendar. If you are creating a meetings link for an event or conference, you can specify a custom date range for booking. Click the When a meeting can be scheduled dropdown menu and select Custom date range. Click the date picker fields and set your time range. A custom date range cannot be longer than 10 weeks. Start time increment: set the frequency of your meeting start time. For example, if you are available between 10am and 12pm for a 60 minute meeting, and your start time increment is 15 minutes, a prospect can book 60 minutes with you at 10:00am, 10:15am, 10:30am, etc. When you're done setting up your availability, click Next. Customize your form questions. By default, First Name, Last Name, and Email are required fields. Paid Sales Hub or Service Hub users can add any contact property from your CRM or add a custom question. Click + Contact property or + Custom question. Use the dropdown menu to select a property, or enter a question into the field, then click Save. If you want to make the field optional, clear the Required checkbox to the right of the field. Click Save changes, or customize your Privacy & Consent (GDPR) options for the individual link. If you have GDPR enabled in your account, any meetings links created moving forward will default to GDPR ON. The meeting link will display the default Privacy & Consent text you have set up in your account settings. 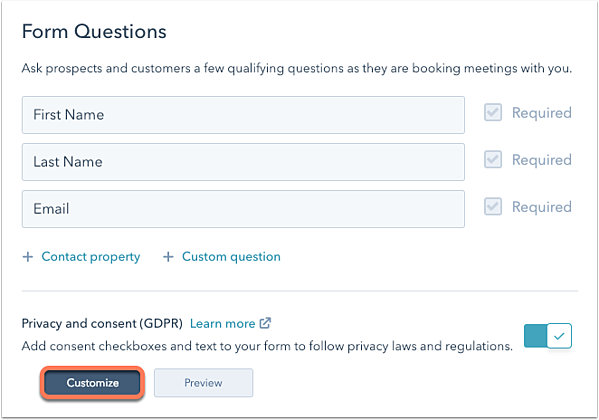 If you want to customize the Privacy and consent (GDPR) options for an individual link, beneath your form questions, click Customize. You can capture a contact's consent to communicate to a specific subscription type, or capture legitimate interest on your meetings link. In the Customize marketing consent panel, select Consent or Legitimate interest from the dropdown menu. 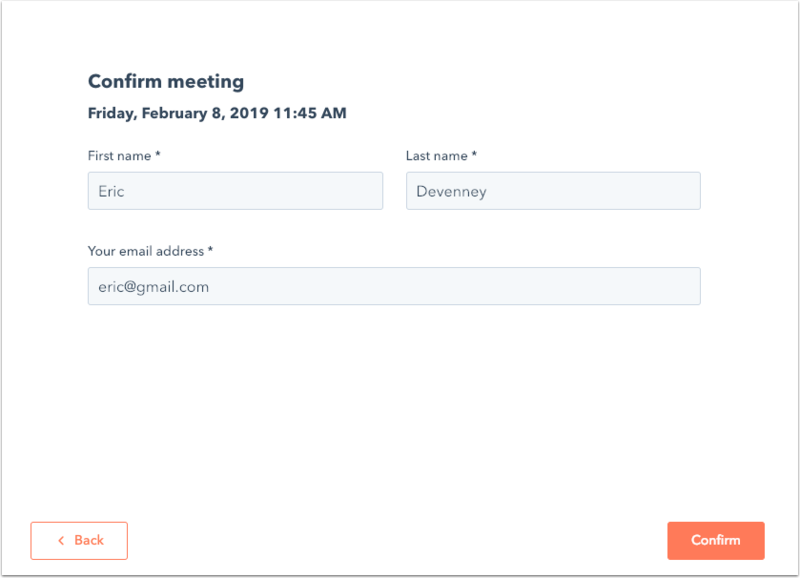 Consent: edit the communication consent text, then add additional subscription types/checkboxes to allow visitors to consent to communication from multiple subscription types on a single meetings link. Click + Add another checkbox, then select a consent type and edit the text that will appear next to the checkbox. Legitimate interest: select a lawful basis from the dropdown menu. To add more subscription types so you can capture multiple subscription types implicitly, click + Add another subscription, then click the Subscription type dropdown menu and select a subscription type. The default subscription that you select in meetings is "one-on-one" communication. It's an internal subscription type in your HubSpot account. Edit the link's privacy and consent text. Any changes made to an individual link's Privacy & Consent options will override the default text set in your account settings. Learn more about customizing your Privacy & Consent options. To see how your consent options will render on your meeting link, click the Preview tab. When you're done editing your form questions or Privacy & Consent options, click Save changes. Hover over the meetings link and click Copy link. Share the link with your contacts by adding it as a hyperlink in the body of your email or email signature. If you're a Sales Hub or Service Hub user, you can also embed the link on your website. To do so, hover over the link, click the Actions dropdown menu, then select Embed. Then add the embed code to your website pages. 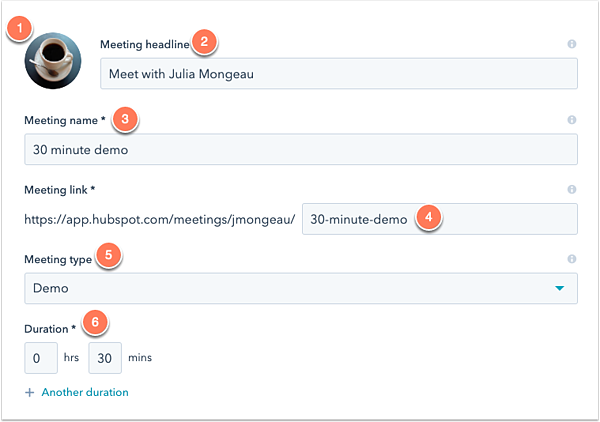 When a prospect clicks on your meetings link, they can select a date, time, and length of time if you've set multiple duration options. Once your prospect selects the meetings date/time, they will be asked to confirm the booking. If you've added properties or questions to the meeting, they'll be prompted to enter that information here. After someone books a meeting, you'll get an email alert with the booking time and the contact's name. You can also click to view the contact in the CRM or view the calendar event in your integrated default personal calendar (if you have additional calendars integrated, the invitation will not be added to them). The prospect will also receive a calendar invitation with all of the meeting details. Please note: changes to meeting descriptions on the contact record will only be sent to the contact if you are using Google Calendar and have enabled the Google Calendar two-way integration with HubSpot. If you are using an Office 365 calendar or do not have the integration enabled, update the meeting description in the calendar event to send changes to the contact, not in the contact record. If you lose access to one of your integrated calendars, contacts will not be able to book meetings with you, even if you have other integrated calendars. 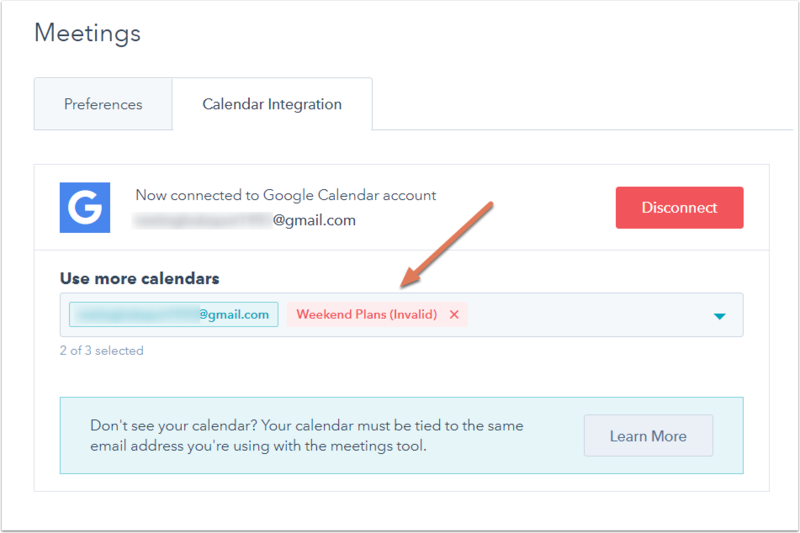 You'll receive an email notifying you that someone is trying to book a meeting with you and the calendar that you have lost access to will appear in red on your calendar integrations page. You can either remove the calendar from your calendar integrations page in your meetings settings by clicking the X beside it, or you can reach out to the person who owns the calendar and ask them to give you access to it again. Once you gain access, revisit this calendar integrations page in your meetings settings and refresh the page.